Every year Jack kills the Giant, Aladdin rubs the lamp, and Cinderella marries the Prince. For centuries nobody has dared question these established routines. 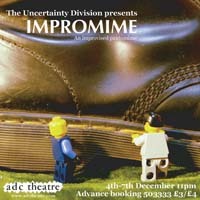 Now Impromime gives you the chance to watch completely different stories unfold, as The Uncertainty Division ventures into the world of pantomime where anything could happen. Ever wanted to see Cinderella marry the Genie? Jack kill the Prince? Aladdin rub the Giant? Now you can. It is of course impossible to offer a synopsis for an improvised show, but it is likely that someone will dress up as someone else, a local lad or lass will turn out to have a hidden secret, and lots of people will sing with very little reason. The panto villain will unleash all sorts of mayhem, which will cause untold problems and excitement for the other characters. They’ll all live happily ever after, except for the ones that don’t live happily ever after, and the ones that don’t live ever after. Impromime is usually a one hour format, although for some venues it is desirable to work with a slightly longer time. 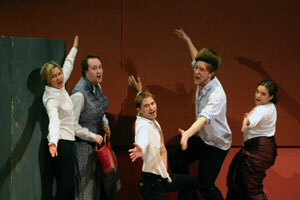 We start with a warm up where we also take sufficient ideas from the audience to kick-start the show. This then proceeds, with songs, villains and heroes a-plenty, on its fully-improvised way - perhaps taking additional ideas from the audience as it goes - until a happy ending is reached (or, if there’s a controversial twist, with the bad guy walking off with the love interest, leaving the hero to rot in jail). Best taken from age eight, annually, until death, the show is suitable for 5+; while not a family show as such, each show is tailored to the actual audience. Improvised pantomime can involve a large amount of audience participation, and obviously we cannot control what people shout out when enthused, but we always ensure that suggestions we take, and material we generate ourselves, will be suitable for the audience we have. First performed at the ADC Theatre, Cambridge, and since toured in winter 2005-2006 in the south of England, the team behind Out Of Your Mind – “one of the funniest things I’ve ever heard” (The Guardian) – and An Extremely Memorable Emergency – “utterly ridiculous and rather sweet” (The Scotsman) – welcome you into a story of your own invention. Pantomime has never seen audience participation like this. © Copyright The Uncertainty Division 2002-2007.